Tea is such a soothing thing and what is better than tea? A Tea Party of course. Yes my cookbook collection grows yet again. Went to the Le Creuset store to see if they carried any fuel for my fondue pot. The day I made fondue I ended up using a sterno can to heat up my fondue pot. I was out of fondue fuel and unable to locate any locally. So I stopped by the outlet store to see if they had any, which of course they did not. However they did have this cute recipe book and was easily given into buying it. My daughter said to me that why yes I did need another cookbook. I needed one to make her tea sandwiches and other goodies. She is like me and loves the idea of taking tea and having others over for it. A tradition in the United States that is just not common anymore, but there are tea houses are now popping up instead. So the plan is to have a tea party and invite guests for tea. Serve several pots of tea, eat cute little sandwiches and tasty desserts, and of course have lots of fun. 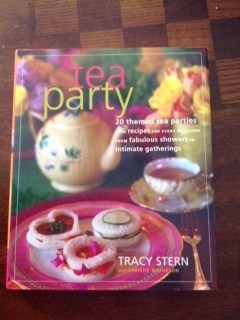 Now to plan the menu as this is not the only book on tea parties I own. Wonder who I will invite? I totally love tea. I take a cup everyday at 3.00pm. It’s such a great feeling. The book looks amazing. Thanks for sharing! Liz, I love tea too.Living in Georgia and it being the South, there does seem to be a lot of sweet tea made at home. My guilty pleasure is to shop at Teavanna. Currently I am drinking a Apple Cider blend from there. Smells so good and very Fall inspired. A friend up the street does Victorian Teas for groups. She has a collection of hats and jewelry and the ladies dress up and she serves them tea and cakes and sandwiches! Her “business” has grown…mostly by word of mouth. It’s become a favorite birthday “gift” for local groups to fete a member. Love the idea of an old fashioned tea party. Have fun with this idea, wish I could join in the fun.